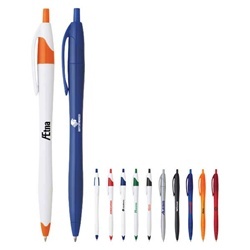 Promotional Logo Cougar Ballpoint is made of rugged ABC 100% plastic material. Imprinted Cougar Ballpoint is designed with click-action mechanism. Promotional Logo Cougar Ballpoint is available in 21 colors: Black w/Silver Trim, Blue w/Silver Trim, Green w/Silver Trim, Pearlescent Neon Green, Pearlescent Neon Orange, Pearlescent Neon Pink, Pearlescent Neon Yellow, Red w/Silver Trim, Silver, Solid Black, Solid Blue, Solid Yellow, Translucent Blue, Translucent Orange, Translucent Red, White w/Black Trim, White w/Blue Trim, White w/Green Trim, White w/Orange Trim, White w/Red Trim, and White w/Orange Trim. Available sizes: 5.5-inch H.